The main goal of the book is the presentation of the last theoretical and experimental works concerning fuel injection systems, mainly in small power two-stroke engines as well as in marine engines. This book includes thirteen chapters devoted to the processes of fuel injection and the combustion that takes place in a stratified charge within the cylinders of two-stroke engines. In the first two chapters, the division into different injection systems in two-stroke engines and each injection system is briefly described. Various theoretical and practical solutions of fueling system designs are described. In Chapter Three, mathematical models, the spatial movement of gas in the cylinder and the combustion chamber are introduced, taking into account the turbulence of the charge. Chapter Four relates to the behavior of fuel injected into the gaseous medium, including evaporation processes, disintegration and processes occurring while the fuel drops connect with the wall. The next section describes the zero-dimensional model of fuel injection in two-stroke engines along with examples of numerical calculations. The sixth chapter is devoted to CFD multi-dimensional models of movement and evaporation of the fuel in a closed gaseous medium, occurring also in other engine types. Chapter Seven describes a two-zone model of the combustion process and the effect of the geometry of the combustion chamber on the flame propagation with a simplified verification model of combustion. Chapter Eight compares the propagation phase of gas and liquid fuels concerning direct fuel injection as well as the direct fuel injection from the cylinder head and the thermodynamic parameters of the charge. 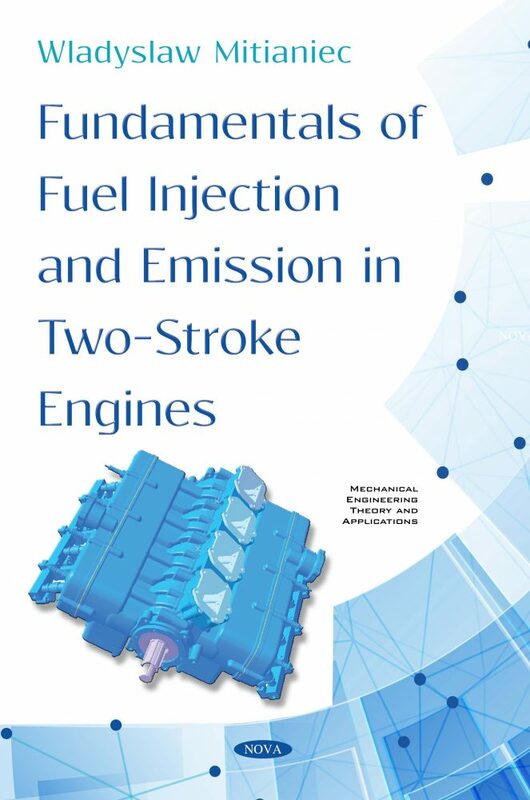 The formation of the components during the combustion process in the direct fuel injection two-stroke engine was obtained by numerical calculations and results are discussed in Chapter Nine. Chapter Ten describes the parameters of the two-stroke engine with a direct fuel injection carried out at the Cracow University of Technology. Additionally, the chapter presents CFD simulations of fuel propagation and combustion processes, taking into account the formation of toxic components and exhaust gas emission. The processes of two direct rich mixture injection systems – FAST and RMIS – developed in CUT are presented in Chapter Eleven. Miscellaneous problems of direct fuel injection, such as characteristics of fuel injectors, problems of direct gaseous fuel injection, and the application of fuelling systems in outboard engines and snowmobile vehicles are presented in Chapter Twelve. A comparison of working parameters in two- and four stroke engines is also mapped out. The last chapters contain the final conclusions and remarks concerning fuel injection and emission of exhaust gases in small two-stroke engines. This book is a comprehensive monograph on fuel injection. The author presents a series of theoretical and design information from his own experience and on the basis of the works of other authors. The main text intends to direct fuel injection with respect to gas motion in the combustion chamber and influence the injection parameters for exhaust emission. The book presents its own theoretical work and experimental tests concerning a two-stroke gasoline engine with electrically controlled direct fuel injection. The book describes the processes of a general nature also occurring in other types of engines and presents a comparison of different injection systems on working parameters and gas emission. The book contains 294 images, 290 equations and 16 tables obtained from the CFD simulation and experimental works. AVL. (1998). Information materials - Small Engine Technology. Plohberger, D., Mikulic, L., and Landfahrer, K. (1988). “Development of a fuel injected two-stroke gasoline engine.” SAE 880170, International Congress and Exposition, Detroit. Jarnuszkiewicz, S. (1979). Wybrane zagadnienia silników hybrydowych, Praca habilitacyjna, Kraków [Chosen problems of hybrid engines, Habilitation Dissertation, Cracow]. Jarnuszkiewicz, S. (1977). Opis patentowy. Patent Nr 95190, Silnik spalinowy dwusuwowy dwusuwowy z bezpompowym wtryskiem paliwa z zapłonem iskrowym [Patent description. Polish Patent No. 95190, Two-stroke engines with pumpless fuel injection and spark ignition]. Marek, W., and Juda, Z. (1996). “Perspektywy zastosowania dwusuwowego silnika III generacji w pojazdach o zmniejszonej emisji.” Materiały konferencyjne KONES'96, Zakopane, ISBN 83-900666-5-3 [Perspectives of application of 3rd generation two-stroke engines in vehicles with decreased emission, Conference Proceedings KONES’96, Zakopane]. Jarnuszkiewicz, S. (1993). “Die Zweitaktmotoren mit pumpenloser Kraftstoff einspritzung mit Hilfe von heissenAbgasen.” Fahrzeugmotoren im Vergleich - Tagung Dresden [“The two-stroke engines with pumpless fuel injection with the aid of hot exhaust gases.” Vehicle engines in comparison - Dresden conference, 3rd and 4th June 1993 VDI reports No. 1066], 3. und 4. Juni 1993 VDI Berichte Nr. 1066 VDI-Gesellschaft Fahrzeugtechnik. Rochelle, P. (1994). “Delayed charging: a means to improve two-stroke engine characteristics.” SAE Paper 941678, SAE Off-Highway & Powerplant Congess & Exposition, Milwaukee. Gentili, R., Frigo, S., and Tognotti, L. (1994). Development of a pumpless system for two-cycle S. I. engines, SAE Paper 940397, SAE International Congress & Exposition, Detroit. Landfahrer, K., Plohberger, D., and Alten, H. (1989). Thermodynamic analysis and optimization of two-stroke gasoline engines, SAE Paper 890415, SAE International Congress & Exposition, Detroit. Leighton, S. R. et al. (1993). “The orbital combustion process for future small two-stroke engines.” A new generation of two-stroke engines for the future?, International Seminar, November 29–30, 1993, Rueil-Malmaison, ISBN 2-7108-0654-1. Coplin, N. (1996). “Application of air assisted direct injection to high performance sport motorcycles.” Orbital Engine Corp. Ltd.
	Worth, D., Coplin N., McNiff, M., and Stannard, M. (1997). “Design considerations for the application of air assisted direct in-cylinder injection systems.” SAE 972074, Small Engine Technology Conference, Yokohama, October 28, 1997. Laimböck, F., Klasnic, H., Grilc, S., Meister, G. et al. “AVL SDIS Mk.II - Low Cost Automotive FI Applied to 2-Stroke Engines for Future CARB - Regulations,” SAE Technical Paper 1999-01-3285, 1999, https://doi.org/10.4271/1999-01-3285. Landfahrer, K., Plohberger, D., and Alten, H. (1989). “Thermodynamic analysis and optimization of two-stroke gasoline engines,” SAE Paper 890415, SAE International Congress & Exposition, Detroit, https://doi.org/10.4271/890415. Coplin, N. (1996). Application of air assisted direct injection to high performance sport motorcycles, Orbital Engine Corp. Ltd.
	Worth, D., Coplin N., McNiff, M., and Stannard, M. (1997). “Design considerations for the application of air assisted direct in-cylinder injection systems,” SAE 972074, Small Engine Technology Conference, Yokohama, October 28, 1997. Shawcross, D., and Wiryoatmojo, S. (1997). “Indonesia's Maleo car, spearheads production of a clean efficient and low cost, direct injected two-stroke engine,” Orbital Engine Corp. Ltd.
	Nuti, M., Pardini, R., and Caponi, D. (1997). “FAST injection system: PIAGGIO solution for ULEV 2T SI engines,” SAE 970362, SAE International Congress & Exposition, Detroit. Duret, P., and Venturi, S. (1993). “The IAPAC fluid dynamically controlled automotive two-stroke combustion process,” A New Generation of Two-Stroke Engines for the Future? International Seminar, November 29–30, 1993, Rueil-Malmaison, ISBN 2-7108-0654-1. Leighton, S. R. et al. (1993). “The Orbital Combustion Process for Future Small Two-Stroke Engines”, A New Generation of Two-Stroke Engines for the Future? International Seminar, November 29–30, 1993, Rueil-Malmaison, ISBN 2-7108-0654-1. Nomura, K. and Nakamura, K. (1993). “Development of a new two-stroke engine with poppet-valves: Toyota S-2 engine,” A New Generation of Two-Stroke Engines for the Future? International Seminar, Rueil-Malmaison, ISBN 2-7108-0654-1. Bell, G. and Finucci, C. (1997). “Exhaust emissions sensitivities with direct injection on a 50 cc scooter,” SAE Paper 970365. AVL. (1998) - Information materials – technical leaflets. Small Engine Technology. Monnier, G., Duret, P., Pardini, R., and Nuti, M. (1993). “IAPAC two-stroke engine for high efficiency low emissions scooters,” A New Generation of Two-Stroke Engines for the Future? International Seminar, Rueil-Malmaison, ISBN 2-7108-0654-1. Ahmadi-Befrui, B., Branstetter, W., and Kratochwill, H. (1989). “Multidimensional calculation of the flow processes in a loop scavenged two-stroke cycle engine.” SAE International Congress and Exposition Detroit, SAE Pap. No 890841. Launder, B. E. and Spalding, D. B. (1974). “The numerical computation of turbulent flow,” Computer Methods in Applied Mechanics and Engineering 3: 269-289. Blair, G. P. (1990). Design and simulation of two-stroke engines, 1996, SAE R-161. Mitianiec, W. and Jaroszewski, A. (1993). Modele matematyczne procesów fizycznych w silnikach spalinowych małej mocy, Ossolineum Wroclaw-Warszawa-Kraków [Mathematical models of physical processes in small power internal combustion engines, Ossolineum, Wroclaw-Warsaw-Cracow]. Chen, Y. S. and Kim, S. W. (1987). “Computation of Turbulent Flows Using an Extended k-e Turbulance Closure Model.” NASA CR-179204. Kim, S. W. (1990). “Near-wall turbulence model and its application to fully- developed turbulent channel and pipe flows.” Numerical Heat Transfer B, 17: 101-122. Kim, S. W. (1990). “Numerical investigation of separated transonic turbulent flows with a multiple-time-scale turbulence model.” Numerical Heat Transfer A, vol. 18: 149-171. Kim, S. W. and Chen, C. P. (1989). “A multi-time-scale turbulence model based on variable partitioning of the turbulent kinetic energy spectrum.” Numerical Heat Transfer B, 16: 193-211. Adeniji-Fashola, A. and Chen, C. P. (1990). “Modeling of confined turbulent fluid-particle flows using Eulerian and Lagrangian schemes.” International Journal Heat Mass Transfer33, 4: p. 691-701. Chen, C. P. and Wood, P. E. (1985). “A turbulence closure model for dilute gas-particle flows.” Canadian Journal of Chemical Engineering 63: 349-360. Mostafa, A. A. and Mongia, H. C. (1988). “On the interaction of particles and turbulent fluid flow.” International Journal Heat Mass Transfer 31, 10: 2063-2075. McKinley, N. R., Kenny, R. G. and Fleck, R. (1994). “CFD prediction of a two-stroke, in-cylinder steady flow field an experimental validation.” SAE Paper 940399, SAE International Congress & Exposition, Detroit. Ludwig, J., Qin, H. Q. and Spalding, D. B. (1991). “Phoenics Reference Manual TR200”, CHAM, London. Amsden, A. A. et al. (1985). “KIVA: A Computer Program for Two- and Three-Dimensional Fluid Flows with Chemical Reactions and Fuel Sprays.” Los Alamos National Laboratory, Report. LA-10245-MS.
	Harlow, F. H. and Nakayama, P. I. (1968). “Transport of Turbulence Energy Decay Rate.” Los Alamos Science Laboratory, University of California, Report No. LA-3854. Kolmogorov, A. N. (1942). “Equations of turbulent motion of an incompressible turbulent fluid.” Izv. Akad. Nauk SSSR Ser. Fiz. 6:1-2, 56-58. Summary of the paper presented at the General Meeting of the Division of Physics and Mathematics of the USSR Academy of Sciences; 26-28 January 1942, Kazan. Yakhot, V. and Orszag, S. A. (1986). “Renormalization group analysis of turbulence. I. Basic theory.” Journal of Scientific Computing 1, 3: 3–51. Willis, G. D. and Truelove, A. H. (1992). “Some practical aspects of cascade testing at high reynolds number.” 11th Symposium on Measuring Techniques for Transonic and Supersonic Flow in Cascades and Turbomachines, Munich, Germany. Mitianiec, W. (1997). “Analysis of combustion process in a direct injection two-stroke engine.” Journal of Kones, 23rd International Conference, KONES’97, Bielsko-Biala (Poland). Abdol-Hamid, K. (2015). “Assessments of k-kL Turbulence Model Based on Menter’s Modification to Rotta’s Two-Equation Model.” International Journal of International Aerospace 2015: http://dx.doi.org/10.1155/2015/987682. Saffmann, P. G. (1970). “A model for inhomogeneous turbulent flow.” Proceedings of Royal Society London vA317: 417-433. Orzechowski, Z. and Prywel, J. (1991). Rozpylanie cieczy. WNT Warszawa [Spraying of liquids. WNT Warsaw]. Bai, C. and Gosman, A. D. (1995). “Development of methodology for spray impingement simulation.” SAE 950283, SAE International Congress & Exposition, Detroit. Jayarantne, D. W. and Mason, B. J. (1964). “The coalescence and bouncing of water drops at an air/water interface.” Proceedings of Royal. Society A. 280: 545–565. Stow, C. D. and Hadfield, M. G., (1981). “An experimental investigation of fluid flow resulting from the impact of a water drop with an unyielding dry surface.” Proceedings of Royal Society A, 375: 419–441. Stow, C. D., and Stainer, R. D. (1977). “The physical products of splashing water drop”, Journal of the Meteorological. Society of Japan, 55: 518–531. Ghandiri, H. (1978). “Raindrop impact, soil splash and cratering.” Ph.D. Thesis, University of Reading. Choi, K. and Lee, H. J. (1992). “Experimental studies on the dynamics and evaporation of tandem liquid droplets in a hot gas flow.” International Journal of Heat and Mass Transfer, 35: 2921–2929. Katasura, N. et al. (1989). “Characteristics of a diesel spray impinging on a flat wall.” SAE Paper 890264. Liu Z. and Reitz, R. D. (1996). “An analysis of the distortion and breakup mechanisms of high speed liquid drops.” International Journal of Multiphase Flow, 23: 631–650. Amsden, A. A. et al. (1985). “KIVA: A Computer Program for Two- and Three-Dimensional Fluid Flows with Chemical Reactions and Fuel Sprays.” Report LA-10245-MS, Los Alamos National Laboratory. Liu, Z. and Reitz, R. D. (1993). “Mechanisms of air-assisted liquid atomization.” Atomization and Sprays 3, 1: 55–75. Kerbin, P. (1993). “Contribution of scientific tools and computer modelling to the understanding of two-stroke engine aerodynamics and direct fuel injection behaviour” in: Duret, P. [Editor]: A New Generation of Two-Stroke Engines for the Future? Proceedings of the International Seminar Held in Rueil-Malmaison, France, November 29-30, 1993, pp. 9–16. Heywood, J. (1998). Internal Combustion Engine Fundamentals, McGraw-Hill, New York. Coghe, P. G. (1993). Private communications. Saffman, P. G. (1968). “The lift on a small sphere in a slow shear flow.” Journal of Fluid Mechanics 31: 624. Dent, J. C. (1971). “Basis for the comparison of various experimental methods for studying spray penetration.” SAE Paper 710571, SAE Transactions 80. Hiroyasu, H., Kadota, T., and Arai, M. (1980). “Supplementary Comments; Fuel Spray Characterization in Diesel Engines.” Combustion Modelling in Reciprocating Engines, pp. 369–408, Plenum Press, New York. Bracco F. V. (1985). “Modeling of engine sprays.” SAE Paper 850394. Lefebre, A. (1989). Atomization and Spray, CRC Press, Washington D.C.
	Gentili, R., Frigo, S., and Tognotti, L. (1994). “Development of a pumpless system for two-cycle S. I. engines” SAE Paper 940397, SAE International Congress & Exposition, Detroit. Rychter, T. and Teodorczyk, A. (1990). Modelowanie matematyczne roboczego cyklu silnika tłokowego, PWN Warszawa, [Mathematical modeling of working cycle of reciprocating engine, PWN, Warsaw]. Blair, G. P. (1990). The Basic Design of Two-Stroke Engines, SAE R-104 Warrendale. Blizard, N. C. and Keck, J. C. (1974). “Experimental and theoretical investigations of turbulent burning model for internal combustion engines.” SAE Paper 740191. Tabaczynski, R. J. (1983). “Turbulence measurements and modelling in reciprocating engines – an overview,” International Conference on Comb. Engineering, 1: 51-64. Tabaczynski, R.J. and Ferguson, C. R. (1977). “A turbulent entrainment model for spark-ignition engine combustion.” SAE Paper 770647. Reid, M. G. and Douglas, R. (1994). “Quasi-dimensional modelling of combustion in a two-stroke cycle spark ignition engine.” SAE Paper 941680. Reid, M. G. and Douglas, R. (1991). “A closed cycle simulation model with particular reference to two-stroke cycle engines.” SAE Paper 911847. Malin, M. R. and Markatos, N. C. (1982). “Analysis and computation of multi-dimensional coal combustion processes.” Meeting of the Fluids Engineering Division at Saint Louis, USA, ASME Paper 82-FE-8: 1-18. Heywood, J. B. (1998). Internal Combustion Engine Fundamentals, McGraw Hill, New York. Mitianiec, W. (1996). “Quasi-dimensional model of combustion in a two-stroke engine with fuel injection system.” Journal of Kones, 22nd International Conference on Combustion Engines KONES '96, Zakopane. Mitianiec, W. (1997). “Analysis of combustion process in a direct injection two-stroke engine.” Journal of Kones, 23rd International Conference on Combustion Engines KONES '97, Bielsko-Biała. Markatos, N. C. and Mukerjee T. (1981). “Three-dimensional computer analysis of flow and combustion in automotive internal combustion engines.” Mathematics and Computers in Simulation (MATCOM)23, 4: 354-366. Blizard, N. C.and Keck J. C. (1974). “Experimental and theoretical investigations of turbulent burning model for internal combustion engines.” SAE Paper 740191. Chen, C. and Veshagh, A. (1992). “A comparison between alternative methods for gas flow and performance prediction of internal combustion engines.” SAE Technical. Paper 921734. Gentili, R., Frigo S. and Tognotti, L. 1994). “Development of a pumpless system for two-cycle S.I. engines.” SAE Paper 940397, SAE International Congress & Exposition, Detroit 1994. Hiroyasu, H., Kadota, T., and Arai, M. (1980). “Supplementary comments; fuel spray characterization in diesel engines.” Combustion modelling in reciprocating engines pp. 369–408, Plenum Publishing, New York. JANAF Thermochemical Tables (1971). National Bureau of Standards Publication NSRDS-NBS37. Han, Z., Fan, L., and Reitz, R. D. (1997). “Multidimensional modeling of spray atomization and air-fuel mixing in a direct-injection spark ignition engine.” SAE Paper 970884, SAE International Congress & Exposition 1997, Detroit. Hiroyasu, H., Kadota, T., and Arai, M. (1983). “Development and use of a spray combustion modelling to predict diesel engine efficiency and pollutant emission”, Bulletin of Japan Society of Mechanical Engineers, 26: 569–575. Heywood, J. B. (1988). Internal Combustion Engine Fundamentals, McGraw-Hill New York. McKinley, N. R., Kenny, R. G., and Fleck R. (1994). “CFD prediction of a two-stroke, in-cylinder steady flow field an experimental validation.” SAE Paper 940399, SAE International Congress & Exposition 1994, Detroit. Dukowicz, J. K. (1980). “A particle-fluid numerical model for liquid sprays.” Journal of Computational Physics., 35: 229-253. Clark, C. J. and Dombrowski, N. (1985). “Aerodynamic instability and disintegration of inviscid liquid sheets.” Proceedings of Royal Society A. 329: 467–478. Spalding, D. B. (1987). “The combustion of liquid fuels”, Imperial College of Science and Technology Computational Fluid Dynamics Unit, London. Lefebvre, A. H. (1989). Atomization and sprays, Hemisphere New York. Vargafeik, N. B. (1975). Tables on the Thermophysical Properties of Liquids and Gases, Halsted Press, New York. Amsden, A. A., O'Rourke, P. J., and Butler, T. D. (1989). “KIVA-II – A Computer Program for Chemically Reactive Flows with Sprays”, Los Alamos National Laboratory, LA-11560-MS.
	Eisenklam, P., Denny, V. E., and Mills, A. F. (1967). “Droplet evaporation: effects of transients and variable properties”, Eleventh Symposium (International) on Combustion, p. 715-727. Han, Z., Reitz, R. D., Claybaker, P. J., and Rutland, C. (1996). “Modeling the effects of intake flow structures on fuel/air mixing in a direct-injected spark-ignition engine.” SAE Paper 961192, International Spring Fuels & Lubricants Meeting, Dearborn, Michigan. Hamill, I. S. and Malin, M. R. (1991). “Turbulence modulation due to the presence of particles.” PHOENICS Journal, 4, II: 212. Moffat, J. and Pericleous, K. (1988). “The modelling of two-phase flows using the general purpose particle tracking program GENTRA”, Proceedings of the 3rd PHOENICS User Conference, Dubrovnik. Spalding, D. B. (1997). “GENTRA User Guide”, CHAM, London. Markatos, N. C. and Mukerjee, T. (1981). “Three-dimensional computer analysis of flow and combustion in automotive internal combustion engines.” Mathematics and Computers in Simulation (MATCOM)23, 4: 354-366. Reitz, R.D. (1987). “Modeling atomization process in high pressure vaporization sprays.” Atomization and Spray Technology 3: 309–337. Amsden, A. A., Butler T. D., O'Rourke, P. J., Ramshaw, J. D. (1985). “KIVA – A comprehensive model for 2-D and 3-D engine simulations.” SAE paper 850554. O'Rourke, P. J. and Amsden, A. A. (1987). “The TAB method for numerical calculation of spray droplet breakup.” SAE Paper 872089. Bracco, F. V. (1985). “Modeling of engine sprays.” SAE Paper 850394. Clift, R., Grace, J. R., and Weber, M. E. (1978). Bubbles, Drops and Particles, Academic Press, New York. Han, Z., Parrish, S., Farrel, P., and Reitz, R. (1996). “Modeling atomization processes of pressure-swirl hollow-cone fuel sprays.” Atomization and Sprays 7, 6: 663-684, doi: 10.1615/AtomizSpr.v7.i6.70. Harlow, F. H. and Nakayama, P.I. (1968). “Transport of Turbulence Energy Decay Rate.” Los Alamos Science Laboratory, University of California, Report No. LA-3854. Mitianiec, W. and Jaroszewski A. (1993). Modele matematyczne procesów fizycznych w silnikach spalinowych małej mocy, Ossolineum, Wrocław-Warszawa-Kraków [Mathematical models of physical processes in combustion engines of small power, Ossolineum, Wrocław-Warsaw-Cracow]. Blair, G. P. (1996). Design and simulation of two-stroke engines, SAE R-161, Warrendale. Franco, A., and Martorano, L. (1997). “A basic method for two-stroke engine air cooling system design and optimization.” SAE Paper 970802. Groff, E. G., and Matekunas, F. A. (1980). “The nature of turbulent flame propagation in a homogeneous spark-ignited engine.” SAE Paper 800133. Blizard, N. C. and Keck, J. C. (1974). “Experimental and theoretical investigation of turbulent burning model for internal combustion engines.” SAE Paper no. 740191. Reid, M. G. and Douglas, R. (1991). “A closed cycle simulatiom model with particular reference to two-stroke cycle engines.” SAE Paper no. 911847, SAE International Off-Highway Congress & Exposition, Milwaukee. Rychter, T. and Teodorczyk, A. (1990). Modelowanie matematyczne roboczego cyklu silnika tłokowego, PWN Warszawa [Mathematical modeling of working cycle of piston engine, PWN Warsaw]. Tabaczynski, R. J. (1997). “Turbulence and turbulent combustion in spark ignition engines.” Progress in Energy and Combustion Science 2: 143-165. Woschni, G. (1978). “Experimentalle Untersuchung des Wärmeflusses in Kolben und Zylinderbüchse eines schnellaufenden Dieselmotors” MTZ, 39, 12. Woschni, G., Fieger, J. (1981). “Experimentalle Bestimmung des örtlich gemittelten Wärmeübergangskeffizienten im Ottomotor.” MTZ 42, 6. Heywood, J. B. (1998). Internal Combustion Engine Fundamentals, McGraw Hill New York. Groff, E. G. and Matekunas, F. A. (1980). “The nature of turbulent flame propagation in a homogeneous spark-ignited engine.” SAE Paper 800133. Keck, J. C. (1982). “Turbulent flame structure and speed in spark ignition engines.” Proceedings of the 19th International Symposium on Combustion, The Combustion Institute, p 1451–1466. Mitianiec, W. (1996). “Quasi-dimensional model of combustion in a two-stroke engine with fuel injection system.” Journal of Kones, 22nd International Conference on Combustion Engines KONES’96, Zakopane, Poland. Abraham, M. and Prakash, S. (1992). “The theory of cyclic variations in small two-stroke cycle spark ignited engines – an analytical validation of experimentally observed behaviour.” SAE Paper 920426. Hires, S. D. and Tabaczynski R. J. (1978). “The prediction of ignition delay and combustion intervals for homogeneous charge, spark ignition engine.” SAE Paper 780232. Keck, J. C., (1982). “Turbulent flame structure and speed in spark ignition engines.” Proceedings of the 19th International Symposium on Combustion, The Combustion Institute, p. 1451–1466. Spalding, D. B. (1979). Combustion and Mass Transfer, Pergamon Press Oxford-New York. JANAF Thermochemical Tables (1971). National Bureau of Standards Publication NSRDS-NBS37. Mitianiec, W. (1999). Wtrysk paliwa w silnikach dwusuwowych małej mocy, Polska Akademia Nauk, Kraków, Poland [Fuel injection in two-stroke Engines of small power, Polish Academy of Science, Krakow, Poland]. Mitianiec, W. (2011). “Aspects of combustion process in a high pressure direct fuel injection two-stroke engine.” Journal of KONES Powertrain and Transport 18. 4:, 289–298, PAN Warsaw. Vibe I. I. (1956). “Semi-Empirical Expression for Combustion Rates in Engines.” Proceedings of Conference on Piston Engines, USSR Academy of Sciences, Moscow, p. 185-191. Wajand, J. A. and Wajand, J. T. (2005). Tłokowe silniki spalinowe średnio- i szybkoobrotowe, WNT Warszawa [Middle and high-speed piston combustion engines, WNT Warsaw]. Campbell, L. Y. and Pollock, W. (1997). “A simulation model for direct-fuel-injection of two-stroke gasoline engine.” SAE Paper no. 970366, SAE International Congress & Exposition, Detroit. Franco, A., Stan, C. and Eichert, H. (1996). “Numerical analysis of the performances of a small two-stroke engine with direct injection.” SAE Paper no. 960362, SAE International Congress & Exposition, Detroit. Taylor, Ch. F. (1985). The Internal Combustion Engine in Theory and Practice, second edition, Massachusetts Institute of Technology Press, Cambridge. Phoenics Guide TR200. (1995). Concentration Heat & Momentum Ltd, London. Corcione, F., Rotondi, R., Gentili, R., and Miglaccio, M. (1997). “Modeling the mixture formation in a small direct-injected two-stroke spark-ignition engine.” SAE Paper 9703364, SAE International Congress & Exposition, Detroit. Amsden A. A., O'Rourke P. J., and Butler, T. D. (1989). “KIVA-II – A Computer Program for Chemically Reactive Flows with Sprays.” Los Alamos National Laboratory, Report LA-11560-MS.
	Kuo, W. T. and Reitz, R. D. (1992). “Three dimensional computations of combustion in premixed-charge and direct-injected two-stroke engines.” SAE Paper 920425. Mitianiec, W. (1997). “Analysis of combustion process in a direct injection two-stroke engine.” Journal of KONES, 23rd International Conference on Combustion Engines KONES ‘97, Szczyrk, Poland. Reid, M. G. and Douglas, R. (1994). “Quasi-dimensional modelling of combustion in a two-stroke cycle spark ignition engine.” SAE Paper 941680, SAE Off-Highway & Powerplant Congress & Exposition, Milwaukee. Han, Z., Fan, L., and Reitz, R. D. (1997). “Multidimensional modeling of spray atomization and air-fuel mixing in a direct-injection spark-ignition engine.” SAE Paper 970884, SAE International Congress & Exposition, Detroit. Phoenics Reference Manual TR200 (1991) CHAM, London. The GENTRA User Guide (1997). TR211, CHAM, London. The Beginner's Guide (1994). TR100, CHAM, London. Campbell, L. Y. and Pollock, W. (1997). “A simulation model for direct-fuel-injection of two-stroke gasoline engine.” SAE Paper 970366, SAE International Congress & Exposition, Detroit. Franco, A., Stan, C., and Eichert, H. (1996). “Numerical analysis of the performances of a small two-stroke engine with direct injection.” SAE Paper 960362, SAE International Congress & Exposition, Detroit. Mitianiec, W. and Jaroszewski, A., (1993). Modele matematyczne procesów fizycznych w silnikach spalinowych małej mocy, Ossolineum Wroclaw-Warszawa-Krakow [Mathematical model sof physical processes in small power combustion engines, Wrocław-Warsaw-Cracow]. Rychter, T. and Teodorczyk, A. (1990). Modelowanie matematyczne roboczego cyklu silnika tłokowego, PWN Warszawa [Mathematical modeling of working cycle in piston engines, PWN Warsaw]. Fansler, T., French, D., and Drake, M. (1998). “Individual-cycle measurements of exhaust-hydrocarbon mass from a direct-injection two-stroke engine.” SAE Paper. 980758, SAE International Congress & Exposition, Detroit. Huang, H., Jeng, M. and Chang, N. et al. (1993). “Improvement of Exhaust Emissions from a Two-Stroke Engine by Direct Injection System.” SAE Paper no. 930497, SAE International Congress and Exposition, Detroit. Vibe, I. I. (1970). Brennverlauf und Kreisprozes von Verbrennungs-motoren [Burning process and cycle of internal combustion engines], VEB Technik, Berlin. Melton, L. A. (1990). “Exciplex-based vapor/liquid visualization systems appropriate for automotive gasolines.” Report no. 1, Contract no. 27, Energy Research Applications Program, Texas Higher Education Coordinating Board. Ghandi, J. B., Felton, P. G., Gajdeczko, B. F., and Barcco F. V. (1994). “Investigation of the fuel distribution in a two-stroke engine with an air-assisted injector.” SAE Paper 940394, SAE International Congress and Exposition, Detroit. Ikeda, Y., Nakajima, T., and Kurihara, N. (1995). „Spray formation of air-assist injection for two-stroke engine.” SAE Paper 950271, SAE International Congress and Exposition, Detroit. Chen, Y. S. and Kim, S. W. (1987). “Computation of turbulent flows using an extended k-e turbulance closure model.” Report NASA CR-179204. Kuo, T. and Reitz, R. (1992). “Three-dimensional computations of combustion in premixed-charge and direct-injected two-stroke engines.” SAE Paper 920425. Mitianiec, W. (1999). Wtrysk paliwa w silnikach dwusuwowych małej mocy, Polska Akademia Nauk, Kraków [Fuel injection in small power two-stroke engines, Polish Academy of Science, Cracow]. Amsden, A. A. et al. (1985). “KIVA: A computer program for two- and three-dimensional fluid flows with chemical reactions and fuel sprays.” Report LA-10245-MS.
	Amsden, A. A., O'Rourke, P. J., and Butler, T. D. (1989). “KIVA-II – A computer program for chemically reactive flows with sprays.” Los Alamos National Laboratory, Report LA-11560-MS.
	Heywood, J. B. (1988). Internal Combustion Engine Fundamentals, McGraw-Hill New York. JANAF Thermochemical Tables. National Bureau of Standards Publication NSRDS-NBS37, 1971. Fansler T., French D., and Drake, M. (1998). “Individual-cycle measurements of exhaust-hydrocarbon mass from a direct-injection two-stroke engine.” SAE 980758, SAE Congress & Exposition, Detroit. Mitianiec, W. and Forma, M. (2009). “Simulation and experimental test of spray guided direct fuel injection in a two-stroke engine” Combustion Engines 2009-SC2, PTNSS-2009-SC-43: 105-112, Bielsko-Biała. Mitianiec, W. and Forma, M. (2009). “Influence of charge motion on spray guided direct fuel injection in small power two-stroke engine.” 12th EAEC European Automotive Congress, No 01-017, Bratislava. Mitianiec, W. and Rodak, L. (2012). “Lowering of exhaust emission in modern two-stroke engine.” Journal of KONES Powertrain and Transport Means, 19, 2: 337 - 344, Warsaw. Blair, G. P. (1996). Design and simulation of two-stroke engines, SAE R-161, Warrendale, USA. Courant, R., Friedrichs, K., and Levy H. (1928). “Translation report NYO-7689.“ Mathematische Annalen 100: 32-74. JANAF Thermochemical Tables (1971). National Bureau of Standards Publication NSRDS-NBS37. Kastner, L. J. et al. (1963). “Poppet inlet valve characteristic and their influence on the induction process.” Proceedings of the Institution of Mechanical Engineers 179 1: 955-975. Mitianiec, W. (1999). Wtrysk paliwa w silnikach dwusuwowych małej mocyPolska Akademia Nauk, Kraków [Fuel injection in two-stroke engines of small power, Polish Academy of Science, Cracow]. Mitianiec, W. (2003). “Modelling of thermodynamic parameters in two-stroke engine with pneumatic injection of fuel mixture.” Konstrukcja, badania, eksploatacja, technologia pojazdów samochodowych i silników spalinowych, Zeszyt Nr 26-27, PAN Oddział Kraków [Design, research, exploitation of automobiles and Combustion Engines, vol. 26-27, Polish Academy of Science Division Cracow]. Mitianiec, W. and Jaroszewski, A. (1993). Modele matematyczne procesów fizycznych w silnikach spalinowych małej mocy, Ossolineum, Wrocław-Warszawa-Kraków [Mathematical models of physical processes in small power internal combustion engines, Ossolineum, Wrocław-Warsaw-Cracow]. Nuti, M. et al. (1997). “FAST injection system: PIAGGIO solution for ULEV 2T SI engines.” SAE Paper 970362, SAE International Congress & Exposition, Detroit. Sato, K., Nakano, M., and Ukawa, H. (1991). “Effective energy utilization and emission reduction of the exhaust gas in two-stroke cycle engine.” SAE 911848, SAE Off-Highway & Powerplant Congress & Exposition, Milwaukee. Mitianiec W. (2003). “Reduction of exhaust gas emission in a SI two stroke engine with direct fuel mixture injection.” SAE Paper 2003-32-0048, Small Engine Technology Conference, Madison USA, September 2003. Mitianiec, W. (2003). “Formation of fuel mixture in a SI two stroke engine with direct pneumatic injection.” SAE Paper 2003-01-3164, SAE Powertrain & Fluid System Conference, Pittsburg USA, October 2003. Mitianiec, W. (2003). “Multidimensional modeling and experimental study of exhaust emission in SI two stroke engine with direct fuel mixture injection” Journal of KONES Internal Combustion Engines, Polish Academy of Science, Warsaw 2003, 29th International Scientific Conference on Combustion Engines KONES, Wisła (Poland). Mitianiec, W. (2005). Pneumatyczny system zasilania silnika dwusuwowego o zapłonie iskrowym, Politechnika Krakowska, Seria Mechanika, no. 324, Kraków [Pneumatic feeding system of spark ignition two-stroke engines, Cracow University of Technology, Series Mechanics, no. 324, Cracow]. Mitianiec, W. (2006). “Optimization of the rich mixture injection system in two-stroke engine.” Journal of Kones Powertrain and Transport, 13, 3: 213–224, PAN Warsaw. Durret, P., Lavy, J., and Venturi, S. (1999). “SCIP simplified direct injection for low emissions small two-stroke engines” SAE Paper 1999-01-3289, Small Engine Technology Conference Madison. Gambino, M., and Iannaconne, S. (2001). “Two-stroke direct injection spark ignition engine for two wheelers” SAE Paper 2001 01 1842/4261, Small Engine technology Conference, Pisa. Jin, S.H., Brear, M.J., Zakis G., Watson, H.C. and Zavier, C. (2004). “Transient behaviour of the fuel spray from an air-assisted, direct fuel injector” 15th Australasian Fluid Mechanics Conference, The University of Sydney, Sydney, Australia, December 13–17, 2004. Worth, D., Coplin, N., McNiff, M. and Stannard, M. (1997). “Design considerations for the application of air assisted direct in-cylinder injection systems.” SAE Paper 972074, Small Engine Technology Conference, Yokohama, October 28, 1997. Blanchard, M., Blouin, E., St-Pierr, V. and Leclerc, M. (2005). “A new generation of two-stroke engine.” Quites, Ecologic snowmobile ETS http://www.mtukrc.org/download/ets/ets_design_paper_2006.pdf. Hooper, P.R., Al-Shemmeri, T., and M J Goodwin, M.J. (2011). “Advanced modern low-emission two-stroke cycle engines” Proceedings of the Institution of Mechanical Engineers, Part D: Journal of Automobile Engineering, 225: 1531–1545, DOI: 10.1177/0954407011408649. Boretti A. and Jiang, S. (2014). “Development of a two stroke direct injection jet ignition compressed.” Journal of Power Technologies, 94, 3: 145–152. Cathart, G., Houston, R. and Ahern, S. (2004). “The potential of gasoline direct injection for small displacement 4-stroke motorcycle applications.” SAE Paper 2004-32-0098/20044385. Work, F. (2014). “Development of multi-fuel, power dense engines for maritime combat draft.” Journal of Marine Engineering & Technology 10, 2: 37–46, http://www.tandfonline.com/loi/tmar20. Archer, M. and Bell, G. (2001). “Advanced electronic fuel injection systems – an emissions solution for both 2- and 4-stroke small vehicle engines.” SAE Paper 2001-01-0010, Warrendale, PA.
Subject areas: automotive sector, motorcycle and off-road applications, mechanical departments in technical universities. Job functions: Designers of fuel injection systems and engines, students of technical universities, mechanical scientists and mechanical engineers.